With at least a temporary end to the budget showdown that has kept the government closed for weeks and the U.S. on the brink of default, stocks soared yesterday afternoon, with the S&P 500 closing within 1 point of its all-time high. It’s certainly not surprising that the markets would rally on news that the U.S. will avoid default, but what has some market watchers scratching their heads is why the market didn’t perform worse before the standoff was ended Wednesday evening. 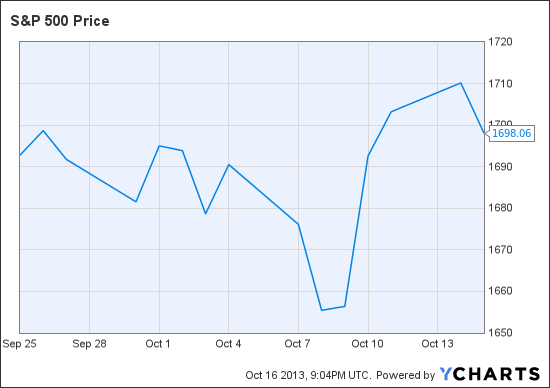 In fact, from the time Ted Cruz gave his filibuster speech on September 25th through October 15th — the day before a deal was reached — the S&P 500 actually rose slightly. Paulsen’s metaphor of the boy who cried wolf may be apt. After all, this is the third debt ceiling showdown we’ve seen in just over three years, and each time the U.S. reaches the brink of default, the antagonists in Washington stand down. But not everyone is so sanguine. According to Gary Thayer, Chief Macro Strategist at Wells Fargo Advisors, “There was a lot of anxiety and markets were really pulling back until about a week ago.” Thayer argues that Wall Street really saw the tension in Washington lessening late last week, when it became clear that President Obama would eventually negotiate over a larger budget deal, and that Republicans wouldn’t be able to maintain their hardline stance on Obamacare for much longer. “I think investors are encouraged by the situation we’re heading into, and that it won’t be just kicking the can down the road,” he says. In other words, Wall Street might hope that it can ignore the constant bickering in Washington, but the fact remains that a major problem in in the nation’s capitol still has the potential to seriously wound the overall economy. And while Wall Street might be getting more used to the heightened rhetoric that has dominated the government over the past several years, it can never fully trust that rhetoric is all that it is.